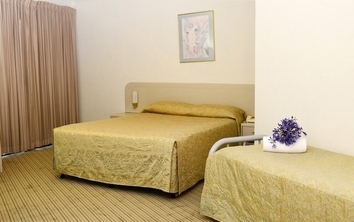 Bankstown Motel 10 is a modern 3 & 1/2 star, family owned, centrally located, stylish & affordable motel. With only 19 well appointed and exclusive , en-suited rooms we are able to offer personal service that is second to none. Motel 10 is set in immaculate grounds, with FREE on-site parking and all rooms are through a private secured central court-yard decorated with plants and palms. We offer FREE BROADBAND INTERNET TO ALL ROOMS. The Motel 10 is nestled only 5km from Homebush Bay Olympic Park and minutes from all major arterials which means travelling to and from the motel is a breeze. 15 kms to Sydney Airport and some 6 Kms to Bankstown Airport. We offer spacious, fully ensuited and quiet accommodation with Queen sized beds, Reverse cycle air conditioning, color TV, DVD available with complimentary DVD library, FREE BROADBAND INTERNET, tea & coffee facilities with refrigerator, clock-radio. Cot available. After a busy day " in the office" or enjoying our Sydney, you can relax in your rooms by surfing the net with our COMPLIMENTARY (FREE) BROADBAND INTERNET to your room, watching a movie from our library or just having a beer or wine in your room or first floor room balcony. Also free on-site, off-street parking. Excellent cooked Breakfast served to your room. Or you may like to use our charge back facility for Dinners with local restaurants, Pizza or other takeaways. Rates are for 2 people. Maximum occupancy is 2 people. Bedding configuration is a Queen bed. Private and spacious ensuite room with toilet / shower / sink. Room has sofa and writing desk and dining table. 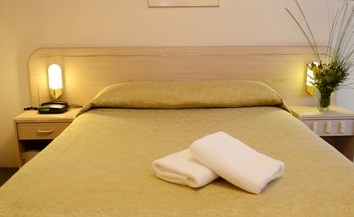 Contemporary spacious room with 1 Queen bed and 2 Single beds. Includes FREE access to wireless broadband, DVD player and on site car parking. Bedding configuration is 1 queen and 3 single beds. Private ensuite room with all linen a sofa and writing desk. Rates are for 2 people. Maximum occupancy is 2 people. Bedding configuration is a Queen Bed and 1 Single Bed. Private and spacious ensuite room with toilet / shower / sink. Most rooms with a sofa and writing desk. Office facilities including fax, photo-copying and telephone messaging, Transport, Courier, other bookings arranged at reception, which is open daily from 630am to 930pm. Check in at 100 pm. Earlier / after hours check-ins is subject to availability and prior confirmation with motel. Registered guest must provide a current Drivers Licence and valid credit card for check_in per House Rules . Free on-site, off-street, parking available. Bus (Route No. 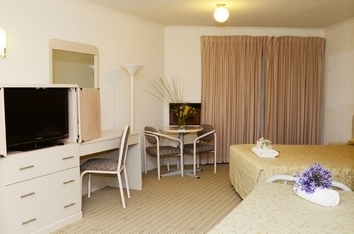 485) 200 metres from motel, at corner of Northcote Rd and Hillcrest Rd, , to Bankstown and Strathfield Train Stations. Approximately 30 minutes by Car or 18 kms to Sydney City Centre (approx $40 by taxi), and 15 Kms or approx 20 Minutes from Sydney airport (approx$30). Transfers from Airport can be arranged with Runway Airport Shuttles on 1300 662 828. The Homebush Olympic site, Sydney Showgrounds, Paddys Flemington Markets and Bicentennial Park are 5 Kms from the Motel.We are closer to Golf, Bowling and RSL and other clubs and Centro Bankstown Shopping and Cinemas is a 3 Km drive. Bankstown Airport with Scenic flights is only 5 Kms away. Eateries and a pub a short walk. DFO (Discount Factory Outlets) within 5 Kms at Homebush. Dunc Grey (Olympic) Velodrome less than 5 kms away.